Montague Crosstown Review: Can A Full-Sized Folding Bike Compete? Montague Crosstown Review: Can a Full-Sized Folding Bicycle Compete? I often curse at my bicycle. I do it when the chain falls off. I do it when I get a flat. But more than anything else, I curse whenever I have to haul my full-sized bicycle through the heavy, swinging door of my cramped bicycle room. The door invariably slams shut. If I don’t yank my bike out of the way in time, crunch. Who designs these things? Frankly, I love commuting by bike, and I wouldn’t give it up. But wouldn’t it be so much easier with a full-size bike I could fold up? Well guess what? Full-sized, full-featured folding road, mountain and commuter bicycles exist, and they’re WAY better than you might expect. Montague is a specialist brand. They have a full lineup of cleverly-designed folding bikes, all featuring full-sized frames. They’re stylish, they feature modern components, and they fold up small enough to fit in the trunk of your car. Intrigued? Me too. So I decided to check out and review the Montague Crosstown commuter bicycle. Spoiler alert: it’s probably the best full-sized, folding commuter bicycle I’ve ever come across. I think the first thing you’ll likely notice about the Crosstown is the looks. It doesn’t look like a collapsible folding bike at all. When people think of folder bikes, they’ll usually picture an odd little frame with small wheels and an obvious break point in the centre. The Crosstown is completely different. I mean, people will likely notice the slightly atypical frame — there is no downtube to speak of, and the seat stays are irregular. The top tube is doubled, and there is a curious quick release skewer sticking out near the seat tube. However, other than that, it looks like a regular hybrid or commuter bike with an eccentric design. Those without a keen eye probably won’t recognize its secret super power until you demonstrate it. Good question! The short answer is easily. The long answer is that the whole frame pivots around the seat tube, effectively allowing you to ‘break’ the bicycle in half. First, you remove the front wheel (equipped with a quick release.) Next you ‘break’ the frame by releasing the quick release skewer on the top tube, and swinging the front half the the bike around. When completely folded up, the whole thing is only a bit taller and wider than a typical 700c wheel. It will literally fit in the trunk of a sedan, or a closet. You can pick it up and carry it. It’s really quite brilliant. Most of what makes a bike awkward to move is the irregular size and shape. When its broken down, the Montague Crosstown is very manageable, perfect for storage or tight elevator rides. The answer is yes, the Montague Crosstown reviews as one of the safest and sturdiest folding bikes on the market. On first ride, I was a bit concerned about the structural rigidity of the frame. No need to worry. The bike features a double top tube, and because the skewer crossed through both of these tubes, it is very sturdy. It feels every bit as strong as a conventional diamond framed hybrid. I was happy to see that Montague took steps to make up for the lack of downtube. The whole frame is made from 7005 aluminum, and it is beefy, with clean welds. I suspect it will last every bit as long as a typical diamond style. If you’re a bike nut, you’re probably most interesting in some technical specs, right? The frame is 7005 aluminum alloy, which gives it a good amount of strength while saving a few pounds. It weighs in at 27 pounds when fully built. Not feather light, but certainly manageable in a foldable commuter bicycle like this. Compared to the competition, it is one of the most lightweight folding bikes around, particularly for the price. The 700c wheels are alloy, with Formula hubs and a CLIX skewer for quick release of the wheels. The bike comes with CST semi-slick tires, 28mm in width. The bike is definitely set up with the urban commuter in mind, and these tires are best suited to a mainly pavement riding style. As for shifting, the Crosstown features a Shimano Altus 7 speed rear derailleur, for 7 speeds in total. It’s a good range for the commuter or casual rider. You’ll only really notice the lack of higher gearing if you’re a speed freak. It’s no road bike, but it has a nice range. The shifter itself is a RevoShift by Shimano. I must admit, I am not a fan of twist or grip style shifters, but this is one of the better brandmarks out there. I love the handlebars! The stem is from Octagon, and it’s a quick release style, so you can raise and lower the handlebars in seconds. That’s handy not only for fit, but also for storage. The brakes are your standard Tektro dual pivots, which provide above average stopping power if you tune them up nicely. It comes in 17″, 19″ and 21″ frame sizes, which should suit most riders. For a bike with an atypical frame, the Crosstown is surprisingly stable and snappy. It is fun in the corners, and with its upright yet sport riding position and thin tires, the bike is quite agile. The brakes should be professionally tuned before riding (especially if you’re building it yourself), but when they’re keyed in they stop on a dime. The Crosstown (like many other hybrid / commuter bicycles in this price range) suffers from a cheap foam saddle, which diminishes from the ride a bit. I’d replace it with a good Brooks at the first opportunity. Shifting is a letdown. The range of the 7 speed derailleur is actually quite usable, but the grip shifter feels cheap, and the Altus derailleur must be tuned well to work without the odd click or jump. Still, I wouldn’t expect any more for the price tag. It gets the job done. Overall, the Montague Crosstown is a lightweight folding bike with a very enjoyable ride quality. It will make most urban riders pretty happy. 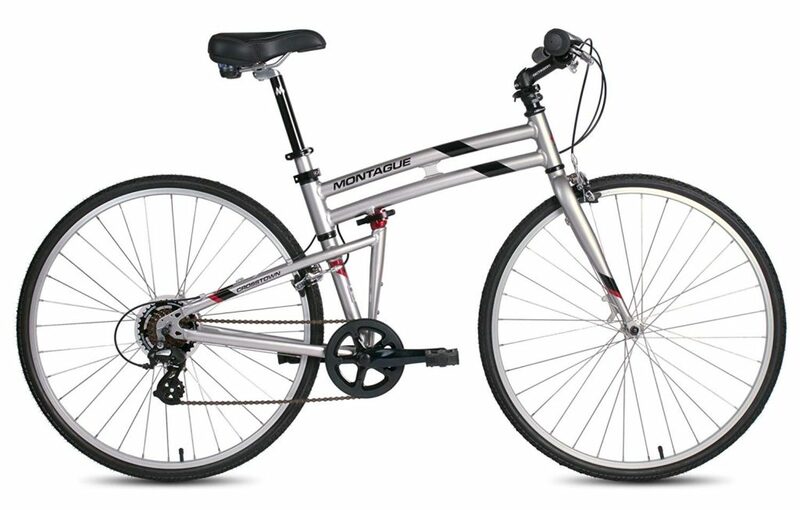 The Montague Crosstown reviews very well in the fun and versatility departments. You can take it almost anywhere, it stores easily, and it is on par with most similarly priced commuter bicycles in shops today. It is certainly one of the best folding bikes to hit the market, and it is phenomenally inexpensive for a full-sized collapsible bike. Most other options in this price range feature smaller wheels or a weaker gearing range. Keep in mind that it is not well suited to high end speed or off-road riding. If you’re hunting for a good urban ride with pavement as the primary riding surface, you’ll love what the Crosstown has to offer. A foldable bicycle with upside? Yes please! It costs about $650, and you can check it out here.